In the spirit of the holiday season, here are some belated gift suggestions and wishes for the New Year for D.C. area teams and sports figures. Mike Shanahan: A one-way ticket to Denver to be head coach for his old friends, owner Pat Bowlen and probable new part-owner John Elway. Or truth serum, or a job at Wikileaks. (He can take Kyle too). Albert Haynesworth: A love for the game of football. Donovan McNabb: A new team he can take to the playoffs for three more seasons. Redskins: A quarterback, a running back, an offensive line, a starting wide receiver, a defensive line, a punter, and a kicker. 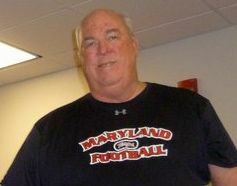 Maryland Athletic Director Kevin “The Grinch” Anderson: A heart. Maryland football: Another program to hire Mike Leach so the Terps can rehire Ralph Friedgen. Adam Dunn plays first base as Stephen Strasburg pitches for the Nationals last summer. Photo by Mike Frandsen. The Washington Nationals signed free agent outfielder Jayson Werth to a seven-year, $126 million deal Sunday, a contract that is the 13th-largest in major league history and will end when Werth is 38. Werth hit 27 home runs and drove in 85 runs last year for the Philadelphia Phillies. He also hit .296, stole 54 bases, and had a National League-leading 46 doubles for the NL East division champs. The Nationals had to overpay Werth to attract him to Washington, which has averaged 99 losses the past three seasons. The move comes after the Nationals refused to resign slugger Adam Dunn to a four-year contract and allowed him to sign with the Chicago White Sox for four years and $56 million. 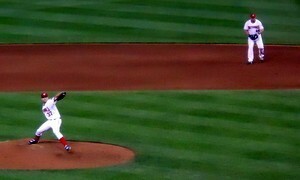 Washington offered Dunn a three-year deal and $35 million at the end of the 2010 season. Dunn was a consistent power hitter during his two seasons with the Nationals, hitting 38 home runs each season with 105 and 103 runs batted in. Dunn has more home runs over the past decade (354) than all but three major league players and hit 38 homers or more in each of the last eight seasons. Werth is a good player, but the Nats should have kept Dunn. For a franchise that has never had a winning season, struggled with mediocre attendance, plays games on a TV station that has no programming at all during certain times of the day, and features a vacant lot full of broken concrete instead of restaurants and bars across from its stadium, the Nats haven’t catered much to the wishes of the fans, who clearly wanted Dunn to stay. Dunn wanted to remain a Nat as well. Dunn will continue to chew gum, blow bubbles and use his relaxed swing to slam colossal home runs over the fence, but it will be in Chicago, not Washington. Meanwhile, Werth will try to prove he is worth the Nats’ investment. One of the best activities to do with children with autism during play dates is to read books, as long as it’s done in an engaging, interactive way. At a recent play date I facilitated, I brought a stack of books from my collection – books that I thought would be most likely to be big hits. Then I let the kids choose which ones they were going to read. To my surprise, they chose “The Cat in the Hat” by Dr. Seuss and “Where the Wild Things Are” by Maurice Sendak, which were my favorite books when I was very young. It turned out great. To see the whole list of books that I brought (those about emotions, social skills, humor, etc. ), ones that didn’t make the cut, plus links to other articles about books for children with autism, click here for my article on Examiner.com.